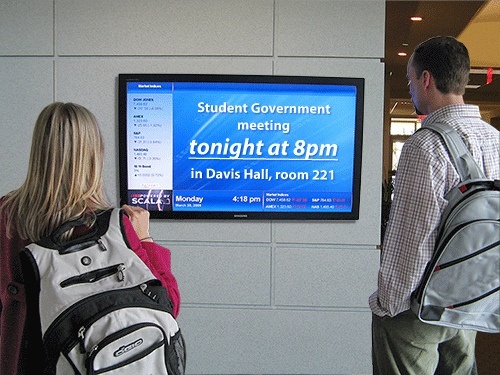 Digital signage is only as good as the content it delivers. Content management systems act as the control, helping your content reach the right audiences. Digital signage is everywhere we look today, transforming the world of retail and playing a major role in industries such as hospitality, transportation, healthcare, education, and financial services. Using these digital consumer touchpoints makes it possible for any business to create more interactive, information-rich environments. After all, we are living in an increasingly digital world, and our attention tends to be drawn to, and held by, compelling and creative digital messages that, more and more, com-pel us to action. We mentioned above the many industries being influenced by digital signage. Here’s a brief look at how they are being used. In retail, digital signage is being used as a means of reinventing traditional bricks and mortar stores, as well as the in-store, real-time customer experience. Instore digital signage allows for more efficient and effective shopping experiences, and is also an effective means to compete with eCommerce. In fast-food restaurants, they’re being used for menu systems and even self-ordering point of sale systems. In hospitality, as a cost-effective way to promote services on large properties. And in healthcare as well as financial settings, they provide information, entertainment, and communication functions. That’s the job of content management software. • Browse, create and customize content. • Monitor your network’s health and security. • Identify screens and their locations. Content management needs vary depending on the size of the network, number of screens, complexity of the content plan, and the range of locations. CMS systems can handle everything from simple set schedules to more complex requirement, like pulling in live Web feeds or varying the content shown in response to real-time input. CMS systems today are available as SaaS (Software as a Service) subscriptions, which can include the subscription-based software, a media player, and an Internet-connected network, and as enterprise—or licensed—systems. Each has its benefits, with proponents of the SaaS systems promoting the cost sav-ings and accessibility, while supporters of enterprise systems are enthusiastic about customization op-tions and security from third-party intrusion. Future systems may evolve to include a hybrid of the SaaS and licensed technology, providing the best of both worlds. Why are CMS Systems So Important? Getting the right content displayed on the right property, for the right audience, at the scheduled time and for the appropriate amount of time is all part of an overall content marketing strategy. Without the systems to ensure that the content being displayed is as planned and scheduled, the impact of the dy-namic digital signage content can be substantially reduced or even discounted, dramatically reducing ROI. In today’s busy world, we have an incredibly short time to make an impression, to grab—and then hold—someone’s attention. Posting the wrong message, the same message over and over again, or the right message to the wrong screen can have spectacularly bad results. Using a CMS system rules out much of the margin for error, and helps you ensure your content is being seen by the right people, and the right time.